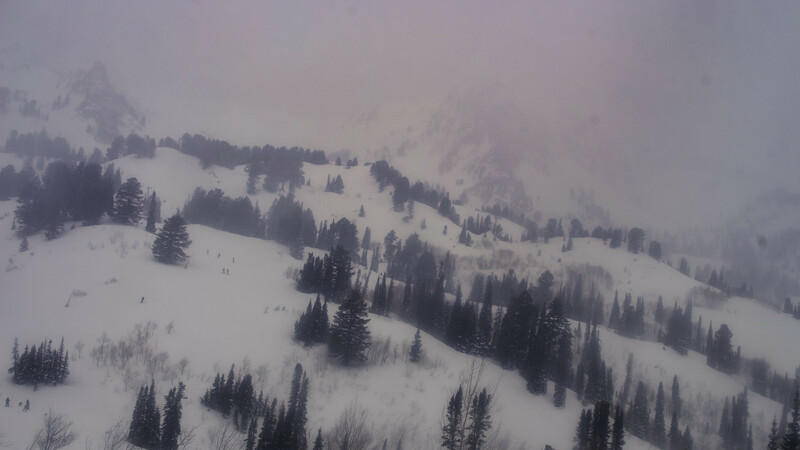 A weakening low pressure system currently over the Intermountain West is providing cloudy conditions over Utah’s mountains today with a bit of snowfall as well. Only up to a couple of inches of snow are forecast for today through this evening, though, as the decaying trough ejects out of our area. As a side note, there also is a Winter Weather Advisory for the valleys (and a good portion of the state of Utah). It should be relatively quiet Sunday morning through the early afternoon as shortwave ridging briefly moves through. There could be a few passing snow showers, but little accumulation is expected during that time. The real fun begins on Sunday afternoon/evening as a cold front associated with an upper low moves through Utah. Between 2-4PM, heavier snow showers should develop just ahead of and along the cold front as is moves into northern and central Utah. 700 mb temperatures (seen below) will be plenty cold for precipitation to be all snow, even in the valleys. 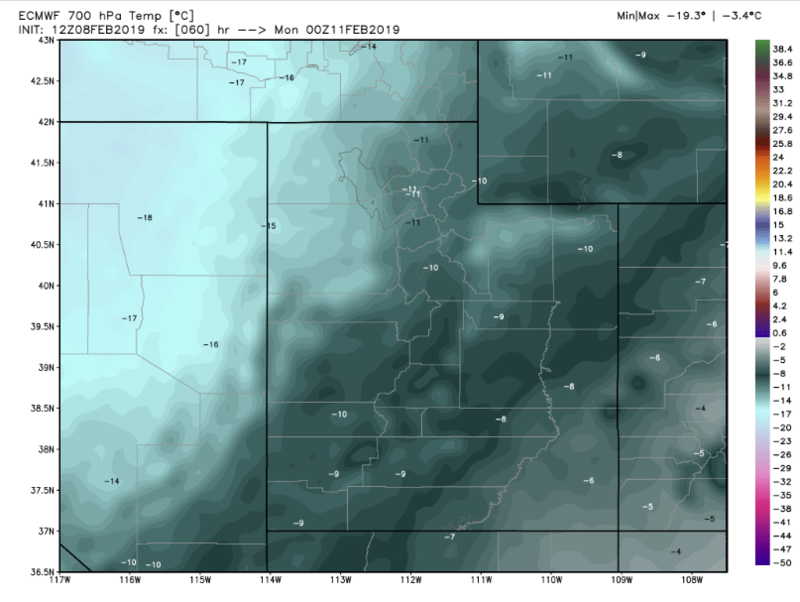 HRRR forecast analysis shows heavy snow along a convective line associated with the baroclinic zone (area in which cold/dense air is separated from warmer/less dense air) moving through Utah. Another look at the HRRR forecast radar without the rain/snow mask reveals relatively strong reflectivity values (>25 dBz) as the line of snow moves through. Contour lines of frontogenesis at 700 mb (crest level) show that these stronger reflectivities are associated with the cold front. After next Monday, things look very active still. There is a lot of model agreement on another strong winter storm with a ton of moisture arriving next Wednesday into Thursday. Furthermore, the overall pattern for the second half of February looks very favorable for storms to pass through our region as models forecast us to be in a generally trough-like pattern. See the 500 mb geopotential height and anomalies animation below showing that the West and Intermountain West will generally have troughs passing through the area for the foreseeable future. Let’s hope we make good use of the “troughy” pattern and keep the winter storm train rolling! Check back tomorrow for an update on forecast storm totals for the storm Sunday/Monday, and we’ll keep you up to date on the potentially big storm Wednesday/Thursday. Doppler Pete you are the best and I can’t wait to see all the beautiful powder!! !